Warm. Recycled American Walnut from Staybull Flooring® blends chocolate tones with creamy white streaks to create a truly sensuous and green floor. Soothing. Sustainably harvested and manufactured in the United States, each plank is VOC free and won’t emit chemicals or odors. Inviting. Once installed, eco-friendly Walnut hardwood from Staybull Flooring® can be savored and enjoyed instantly. Welcoming. 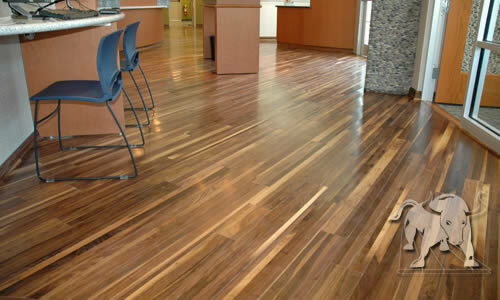 Order a free sample of eco-friendly Black Walnut Staybull Flooring® today. Black Walnut heartwood is rich dark brown to purplish-black and is usually straight grained. Sapwood is a creamy almost white color. Wavy or curly grain is sometimes present. Texture is coarse.